Read about Robin Esrock’s visit to a fountain of youth in Colombia, his rail journey across Siberia, his diving lessons in Papua New Guinea. 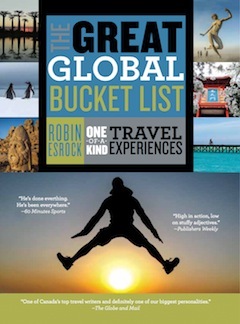 Esrock has traveled to more than 100 countries and, as he writes in the introduction to The Great Global Bucket List, the hybrid guidebook and essay collection “draws together the best of these adventures.” What’s more, Esrock hopes that you won’t just read about his exploits, but make plans for your own. Esrock is one of the many writers participating in this year’s Cherie Smith JCC Jewish Book Festival, which runs Nov. 27-Dec. 1. The local author and journalist has not only been featured in the Jewish Independent before – for The Great Canadian Bucket List, among other things – but has written for the paper as well, so it was nice to catch up with him in anticipation of his Nov. 27, 5 p.m., presentation at the Jewish Community Centre of Greater Vancouver, appropriately called Travel Dreams. 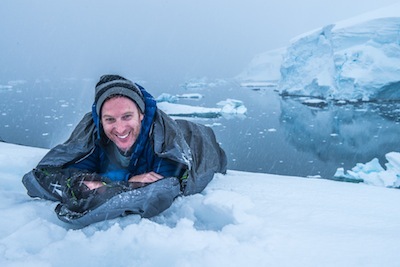 While his career as an intrepid traveler only started after a bike accident – from which he received a broken kneecap and, eventually, a $20,000 insurance settlement that was “just enough,” he writes, “if used sparingly, to book a solo one-year adventure around the world” – he had traveled before. He writes, “A year later, my Hail-Mary pitch for a TV show landed on the right desk at the right time and, seven months later, I found myself as a co-host, writer and producer for a 40-part adventure series filmed in 36 countries. Funded by television networks, I was tasked with seeking out experiences that conformed to my bucket list criteria: Is this destination or activity unique? Is it something I will never forget? Will it make a great story? Is it something everyone can actually do? In addition to experiencing many a far-flung adventure over the last decade or so, Esrock has also found the time to start a family. How has that changed his travel plans? And his own bucket list? Esrock added, “There’s too much bad news out there. The 24/7 news cycle dictates that bad news must be happening somewhere, all the time. The goal with my bucket lists, and with my career in general, is to provide some much-needed good news. In all my journeys, I’ve never been robbed, attacked, violently ill or had my organs harvested (at least to my knowledge!). The world is far more welcoming, reasonable, peaceful and beautiful than you’d imagine. For the full book festival schedule and tickets, visit jccgv.com/content/jewish-book-fest. The idea behind a bucket list is that life is finite and, if there are things we would like to do, we should do them while we can. The Cherie Smith JCC Jewish Book Festival opens the night of Nov. 27 with San Francisco-based writer and psychiatrist Dr. Irvin D. Yalom in conversation with Vancouver psychotherapist Larry Green. The title of Yalom’s most recent book, Creatures of a Day, comes from Marcus Aurelius’ The Meditations, to which Yalom refers more than once in his writings, and from which he quotes at the beginning of his latest book: “All of us are creatures of a day; the rememberer and the remembered alike. All is ephemeral – both memory and the object of memory. The time is at hand when you will have forgotten everything; and the time is at hand when all will have forgotten you. Always reflect that soon you will be no one, and nowhere.” Creatures of a Day is a collection of 10 stories based on his patients’ experiences with loss and illness, and their – and Yalom’s – efforts to live a life of both meaning and pleasure. On Rosh Hashana we will be inscribed and on Yom Kippur we will be sealed, who will live and who will die, who by fire and who by water. It’s a jarring incantation. 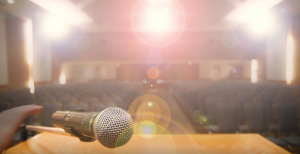 Religious or not, however, this time of year – with fall approaching, a new school year starting – is a time for introspection and account-taking that extends to the very essence of our mortality. Unless we are consciously faced with it, it is rare for people in our society to think deeply about our own deaths. (For an interesting reflection on the topic, see page 46.) But we would do well to keep the transience of life closer to front of mind throughout the year – not to be needlessly grim or to dwell on the negative, but because it is life’s finite nature that affords its value. Like anything that is limitless, life would lose some of its value if it were unending. Time is central to Judaism. We mark the coming and the going of the day, the arrival of Shabbat and the return to the week, the numerous times in the calendar that call our attention to the seasons, our history, biblical events, the new year. Time is likewise central to our existence. Our lives have a beginning and an end; what happens in the middle is what we make it, given the resources we are born into or develop. We do not know when we will die nor what happens to us afterward. We know, though, what happens when others die. We grieve our loss. We lament and experience stages of pain and eventual relative acceptance. At this time of year, as we gather with families and in our congregations and communities, there are countless obligations placed upon us. Our tradition tells us that we accept these obligations willingly and with openness. Our tshuva may be painful or involve humbling ourselves to make amends with those we have harmed, but we do this to improve ourselves, our relationships and our world. In some interpretations, this is when our personal fate will be determined. But our attention naturally turns also to those around us. Who will be at the table this Rosh Hashana and not next? Whose presence do we miss even more keenly at this time of year than on an average day? We are reminded now not to take for granted any of those we love. This is something we should certainly commit to carrying with us throughout the year. The presence of loving family and friends is a joy that we can easily forget to appreciate and we must remember to value these moments. We should also be reminded of the presence of loved ones in a different, more ordinary sense. Perhaps there has never been a society more distracted than our own. The most obvious distraction is our digital devices, which can remove us from the presence of those we love even as we sit across from them at a table. Other distractions have been around longer – worries about work or some other aspect of our lives; obsessions and addictions; the myriad things that can take us away from what is truly most important in our lives. As we mark the High Holidays and the start of a new year, let us be thankful for the presence of those around us, and let us try to be as present as possible in return.